Why is most honey clover honey? Honeybee migration, USDA subsidies, consumer preference. Why Is So Much Honey Clover Honey? Honeybees pollinate almonds and fruit trees, but we don’t have much almond honey. This is where honey comes from. Almond growers pay as much as $220 per colony, critical cash flow for a beekeeper during the first half of the year. For several months before the almond bloom, honeybees are effectively dormant, huddled in what are called “winter clusters,” endeavoring to keep the queen warm while feeding on honey left over from the previous year. When they finally emerge amid the almond trees, the bees are lean, fewer in number, and eager to work. “A colony in the spring, when it’s in build-up mode, might consume a pound of carbohydrate calories a day,” says Miller, who starts off the year with about 10,000 hives (hive and colony are used interchangeably by beekeepers). Carbs come in the form of either nectar or, barring a natural source, sucrose syrup provided by the beekeeper. A hive also ingests as much as a pound of protein-rich pollen every week. Whatever honey is produced goes back into the hive, all of it sustenance to help repopulate a colony that has thinned out, sometimes considerably, over the fall and winter. By mid-March, however, the Great Almond Extravaganza is over and millions of colonies need something else to eat. Miller hauls his hives into Northern California to feed on pit fruit trees—peaches, plums, apricots, cherries, and nectarines—and into Washington for the apples. With so many bees now in search of food, all gathered on the West Coast, market forces push the price growers pay per hive down to about $30. And once again, no surplus honey is generated. The colonies, as diligent as they are, are still in build-up mode. Come July 1, you’ll find Miller in Logan County, North Dakota, by far the largest honey-producing state in the country. His herd has now grown to 15,000 colonies, which he sets down across 250 locations.He visits each landowner once a year to pay “yard rent,” traditionally a generous quantity of honey or, if that’s not how they take their tea, a $100 bill. The USDA provides incentives for farmers in North Dakota and elsewhere to cultivate their unused or marginal land, soil that is too poor quality—too arid or too erodible, say—to otherwise yield a profit. The goal is to reduce erosion, improve water quality, and provide wildlife habitat. Simply put, the government “rents” about 25 million acres of land, under 10- or 15-year contracts at market prices, in exchange for the landowners’ commitment to enrich it. Sweet clover, it turns out, is just right for the job. Sweet clover is drought tolerant, cold tolerant, and better still, nitrogen-fixing, meaning the plants don’t need fertilizer but instead take nitrogen from the air and disperse it, eventually, into the soil. Also, sweet clover is a biennial that reseeds itself. Plant it one year then plant it the next and, in theory anyway, you’re done. It’s a prescient bit of verse, since bees are indeed fewer and fewer these days. “Honey production in North America has gone through almost a cathartic collapse,” says Miller. “Hives aren’t as strong and as vigorous as they once were, there’s a lot less to eat, and we need a breakthrough on Miss Varroa and her children.” What Miller is talking about is sometimes referred to as the three P’s: fatal parasite infestation—from a mite called Varroa destructor—dwindling pastureland, and overuse of pesticides. Miller sums up the pastureland and pesticide problems like this: “Too much corn and too much soybeans means not enough forage for bees. A corn and a soybean field is now farmed so intensively that nothing grows inside that crop, besides the corn or the soybean. There’s no weeds, there’s no mustard, there’s no volunteer stuff in there. It’s all been sprayed.” The term volunteer refers to anything not planted by the farmer. “I’m driving past a soybean field right now,” Miller told me, during a conversation from the road, “and there is no other vegetative green in that field besides soybeans. It’s a desert. If you’re a honeybee, you fly right over it.” As for parasites, Varroa destructor, first detected in the United States in the mid-1980s, has devastated America’s bee population and, by extension, its honey production. 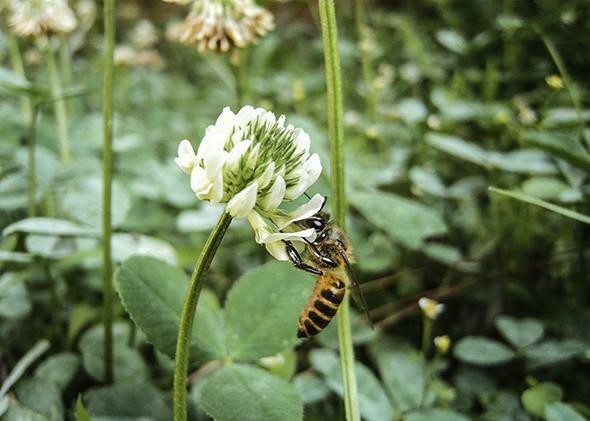 Clover honey, most packers agree, is dependably tasty with broad appeal, but relatively pedestrian in contrast to the darker, more robust honeys such as gallberry, Chinese tallow, or spotted knapweed. Flottum, co-author of The Honey Connoisseur, says these varieties have a strong, lingering aftertaste and more complex notes. But, as Miller puts it, “The customer has said, we want a lighter, milder honey, and that’s what the packers try to achieve. Hence the demand for the Great Plains—Manitoba, Saskatchewan, Alberta, Montana, the Dakotas, and Minnesota—those light, mild honeys that occur up here.” Much of which is clover honey. The more ominous threat, of course, is from those pernicious P’s. The National Agricultural Statistics Service keeps rough honey-production numbers stretching back several decades. Over the course of the 1990s, the United States averaged 210 million pounds of honey each year. During the aughts, that number fell to 172 million pounds. So far this decade, we’re down to 155 million. At the same time, demand for honey has never been higher, which explains record prices over the past year. Let’s hope that our days in clover aren’t coming to an end.